Noah Budnick is Deputy Director of Transportation Alternatives, a New York City bicycling, walking, and public transit advocacy group. TransAlt is regarded as one of the leading-edge transportation advocacy groups in the United States and Noah is right in the mix organizing and educating New York residents, pushing for policy and infrastructure reform, and more. Part one of this two-part interview covered Noah’s personal attraction to cycling, views on transportation options, and more. Part two picks up with New York City’s major bike infrastructure overhaul and its impact on ridership, how to increasing biking nationwide, and the anti-bike federal transportation bill. 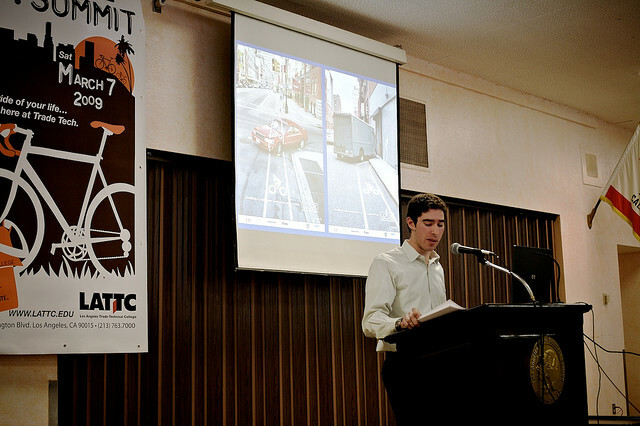 Noah Budnick is Deputy Director of Transportation Alternatives, a New York City bicycling, walking, and public transit advocacy group. TransAlt is regarded as one of the leading-edge transportation advocacy groups in the United States and Noah is right in the mix organizing and educating New York residents, pushing for policy and infrastructure reform, and more. In part one of this two part interview, Noah discusses his early love affair with bikes, his views on the severe crash that hospitalized him in 2005 and his eventual recovery and return to bicycling, his appreciation for transportation options, and more. When did you first get into bikes? Were you one of those kids who learned to ride and never stopped or did bikes come later? I rode growing up in Vermont. Low traffic dirt roads, potholes to “jump,” lots of coaster brake skids. Fun. I don’t think my experience growing up and riding is that different from most people. In fact, if you’re the type of person who rides a lot and is really into bikes and doesn’t think there’s much more to say about biking, then I’m writing this for you. I’m writing this for me too, to see what kind of new ideas come out, what new ways there are to talk about ideas, how people will react to them and then what we can do with it all.